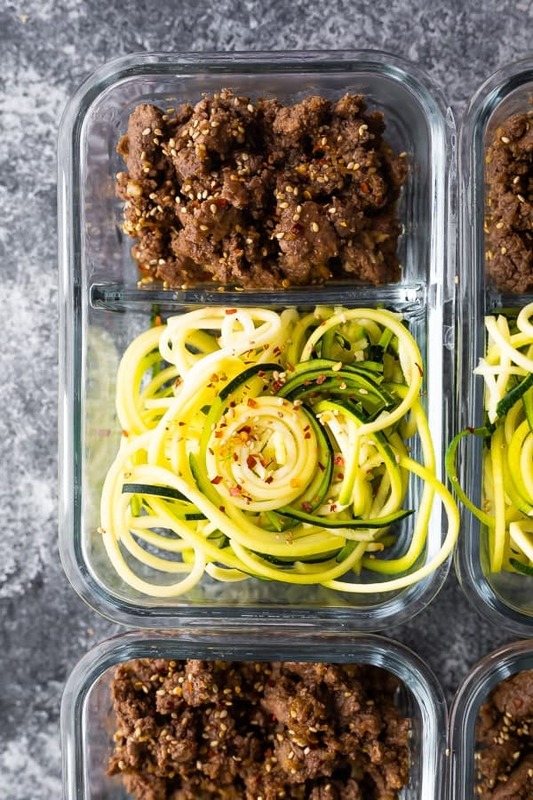 Sesame ginger beef and zucchini noodles is a delicious lower carb lunch option that is perfect for meal prep! Not only is it fast to make, but tastes delicious and only 4 g net carbs. After the popularity of the Egg Roll in a Bowl recipe from December, I’m back with a little remix! 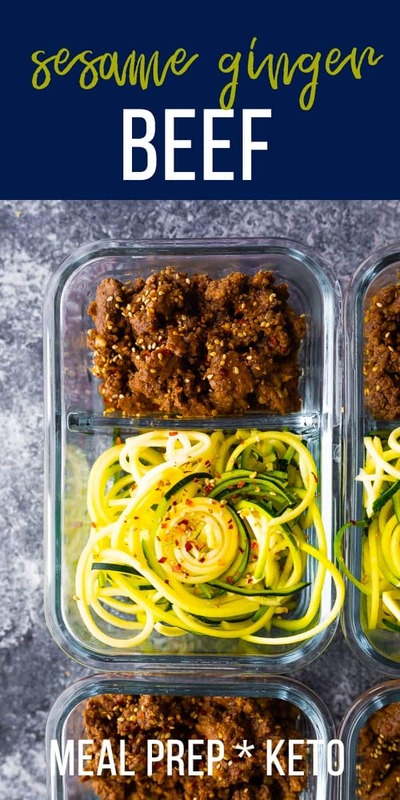 This sesame ginger beef with zucchini noodles has very similar elements: ground beef cooked in a savory sauce, and a low carb vegetable. Unlike the egg roll in a bowl, we do not toss our zucchini noodles in the sauce until we reheat. This is a super simple recipe to prep (ready in 20 minutes! ), and is light, but filling. So good! This is a seriously easy meal to prep! First, shake up a simple sauce of low sodium soy sauce, apple cider vinegar and monk fruit sweetener (or honey). Set aside. 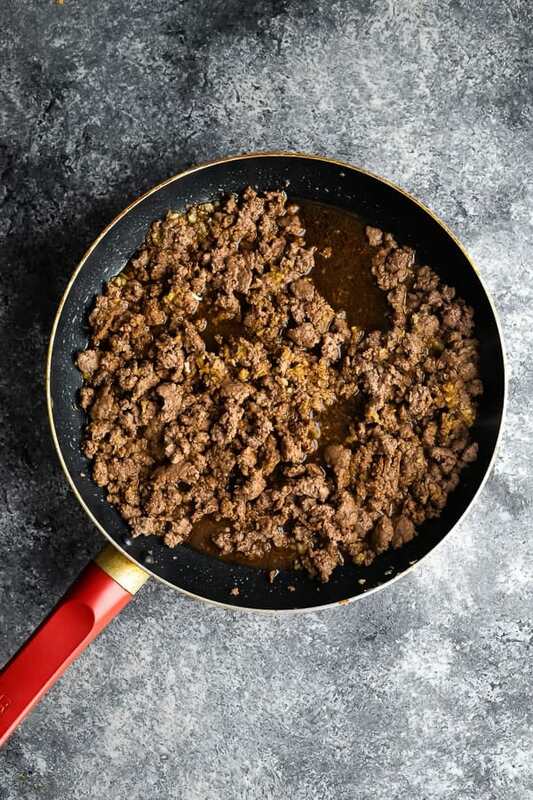 Cook 1 lb ground beef. Make a space in the middle, add sesame oil, and cook 3 cloves garlic & 1 tablespoon ginger for 2 minutes. Add the sauce, toss to coat, and allow it to reduce slightly. Do I cook the zucchini noodles? 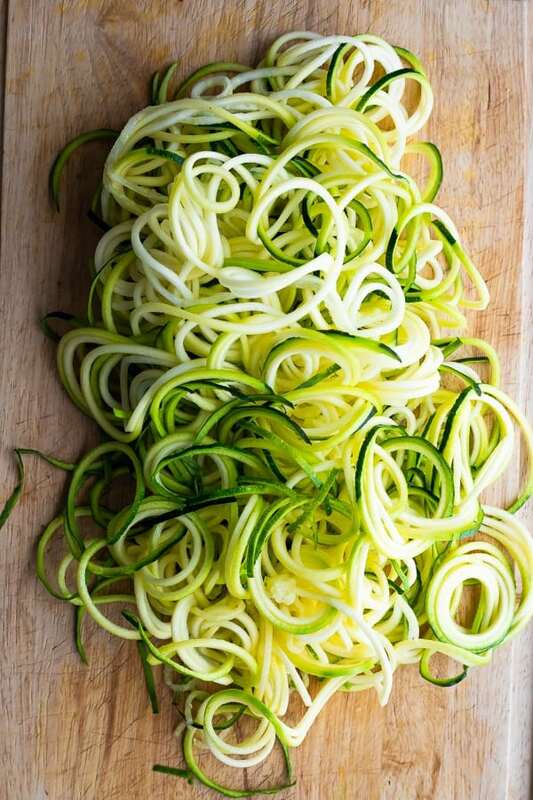 If you are eating right away, yes, add the zucchini noodles to the sauce and cook for a few minutes until softened. 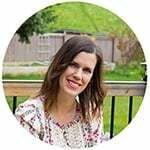 If you are using for meal prep, nope! When you reheat the bowls in the microwave, your zucchini will cook through. Can I swap the zucchini noodles for something? 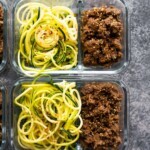 Sure, you can add in some whole wheat spaghetti if you are not low carb, you can swap the zucchini noodles for cauliflower rice, or you can supplement with other veggies. Spiralized carrots and cabbage might be a great addition! Can I make this meatless? Sure, swap the ground beef for a block of extra firm tofu (crumbled). It should work well! Shake together the soy sauce, apple cider vinegar and monk fruit sweetener and set aside. Add the beef and cook, breaking it up with a spatula, for 7-10 minutes, or until cooked through. Carefully drain the pan if needed. Make a space in the beef and add the sesame oil, ginger and garlic. Cook for 1 minute. Add the sauce and toss the beef to coat. Cook for 1 minute until evenly coated and remove from heat. 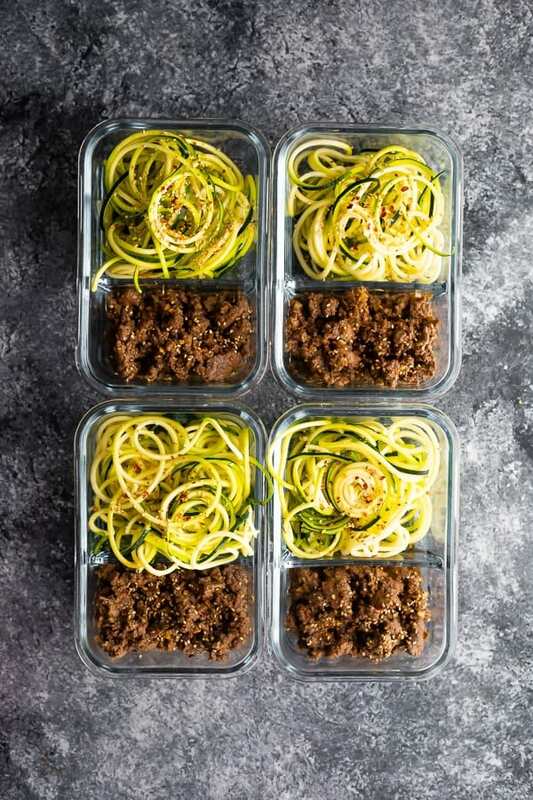 Divide up the beef between four 2-cup capacity storage containers with the spiralized zucchini. Store in air-tight containers in the fridge for up to 4 days. To re-heat, heat in the microwave until steaming hot. Mix the beef/sauce with the zucchini noodles and enjoy.